You might have noticed in last week's blog that there was a shiny new bridge behind the Pont Pasteur. The two bridges are joined on the right bank but are widely separated on the left bank (see Google earth photo below). In that photo we can see the Pont Pasteur and today's bridge (the Pont Raymond Barre) crossing the Rhone and next week's bridges (the Mulatiere Bridges) crossing the Saone with 'La Confluence' between them. Bridges need to be seen in some isolation to properly admire their form. However, there is too much going on around Pont Raymond Barre. Also, a bridge should flow visually from the piers to the superstructure but on the Pont Raymond Barre that flow is interrupted. There are distracting lines on the back of the piers and a full stop between the pier and the soffit. Actually the bridge looks better from a distance (see the top photo), where the interruptions are less noticeable. The Pont Raymond Barre was designed by the architect Alain Spielmann whose book "La Resistance de Sites" was reviewed by The Happy Pontist a few weeks ago. The Pontist does a good job of identifying the deficiencies in Spielmann's designs, which may be the result of not challenging the engineer more often. Actually, the prettiest part of the bridge is up on the deck. The timber walking surface, red sofas, and soaring arches make for an elegant environment to wait for the shuttle. 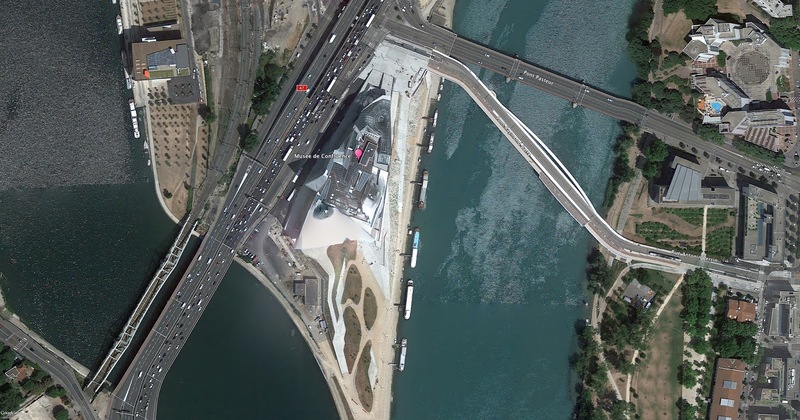 In the photo below the Pont Pasteur is on the far right, a shuttle is waiting for passengers in the center, and the stairway to the Musee du Confluence is on far left. The approach to the Mulatiere Highway Bridge and Fourviere Hill can be seen in the distance.